There’s a place across the marina that for the last couple of months Fat Nancy’s been watching from afar, like a scene of Hitchcock’s Rear Window. It’s tucked away from the the marina drag, it’s always packed so she went to check it out. On arrival, which was early and we were starving, we were shown to one of the corner tables with sofas. Spying big, wooden backgammon boards stacked on the counter and row of shisha … a nod confirmed we would be there for a while. 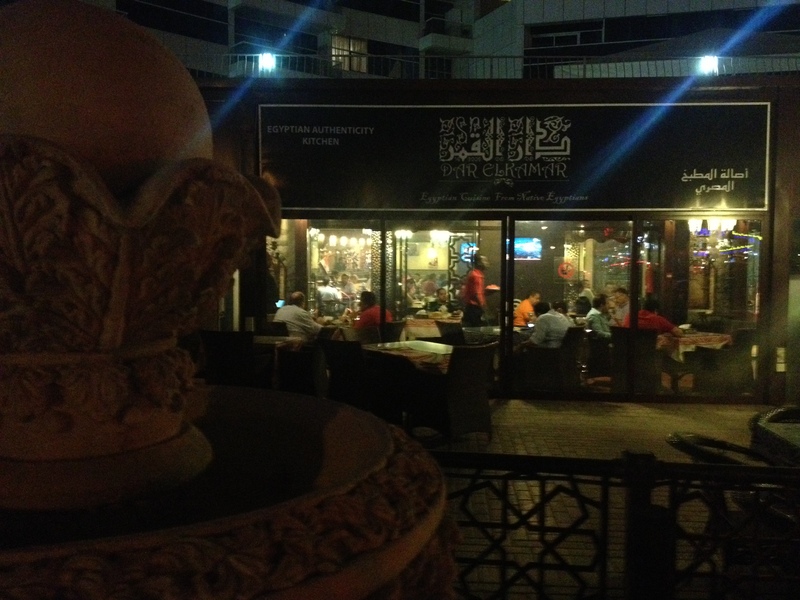 We tried to order food from the waiter, he didn’t speak much English – the split screen TV with six different views of the crowded Tahrir square confirmed this was an authentic Egyptian hang out – he handed us over to the owner with our questions. The owner couldn’t have been more charming and picked out the menu’s best offerings for us: green apple juice, the El Kamar mixed grill cooked to perfection, the fattah moza, the fitir, the lentil soup followed by a medium sweet, Turkish coffee with cardamon and a grape mint shisha. A perfect night, so good in fact that Fat Nancy decided to organise a backgammon tournament there a week later. This time it was Ramadan and the breaking of fasting. Told to arrive at 7pm sharp for an iftar, we rocked up at 7.30 … the buffet in full swing, plates stacked high with every kind of meat (except the obvious), cooked in every way you can imagine… olive packed salads, homemade hummus, tahini, hot bread and then six different Arabic deserts. At midnight, hot falafels coated in sesame seeds and lentil soup. Fat Nancy got to the finals but Baron Darren stole it at the last hurdle – making for an exciting final, which worked out well because it’d be rubbish if a competition organiser took the star prize. Needless to say, six expats sitting playing backgammon in the middle of an iftar stood out like a pot noodle at a middle class dinner soiree. So much so, the ever-charming owners thought they’d help us out with a very generous prize of a free dinner for two. Thanks Cat in the Dunes!